on November 13, 2017, 4:22 p.m. The impact of social media influencers on driving consumer brand awareness, especially among millennials, has reached record highs in the UAE. Fresh research conducted by YouGov Omnibus for leading strategic public relations business BPG Cohn & Wolfe has revealed that 94% of in-house marketers in the UAE believe social media influencer marketing is now very significant for the success of their brands. The second edition of the BPG Cohn & Wolfe Influencers Survey interviewed over 100 in-house marketing and communication experts and brand managers across a diverse range of industries in the UAE to assess current trends in the use of social media influencers in marketing programmes. The latest results show that almost half (49%) of respondents currently work with social media influencers in the region to market their brand – a significant shift from traditional advertising methods. The vast majority also believe that influencer marketing enables them to tap into the digital community and reach their target audience more effectively with a good marketing return on investment (ROI). According to 39% of respondents the top attribute they look for in a social media influencer is that they must be a popular person in the community and have a large following and appealing content. The biggest challenge faced with social media influencers is “finding relevant influencers” (55%), followed by “negotiating terms and conditions” (41%) and “communicating during an assignment” (39%). The results reveal that the majority of social media influencers expect to be compensated based on the number of deliverables (posts, images, videos, etc. ), rather than the success of a campaign through actual and measurable results (driving up sales, website visits, etc.). Only 6% of marketers say that they compensate influencers based on such results or Cost Per Acquisition (CPA). 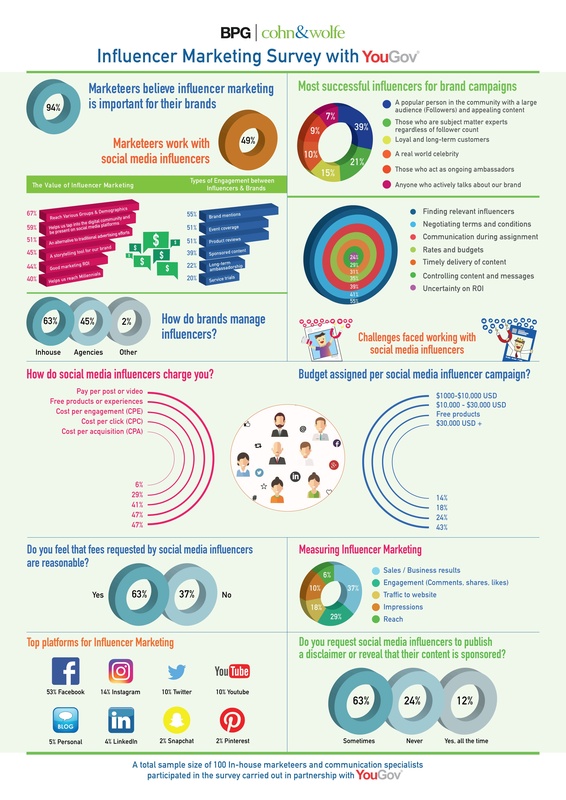 The study reveals budgets for social media marketing are growing, with 43% of respondents indicating that they have spent anywhere from between US$1000-10,000 per social media influencer campaign in the UAE. That said, 34% of those polled indicate that they would spend anywhere between US$10,000 and US$50,000 on a single social media influencer campaign. The majority of marketers, (63%), believe the fees requested by social media influencers are reasonable. The findings indicate openness and transparency are emerging trends in the use of social media influencers in the UAE with 63% of respondents saying they occasionally request influencers to publish a disclaimer or reveal that their content is sponsored. Nearly a quarter (24%) claim they never require it but 12% find it necessary to add a disclaimer via a statement or the use of hashtags such as #Ad or #sponsored. Data collected online by YouGov Omnibus among 100 in-house marketing profressionals in the UAE between 30 August and 17 September 2017 using YouGov’s panel of over 5 million people worldwide. Data is broadly representative of marketing professionals in the UAE.